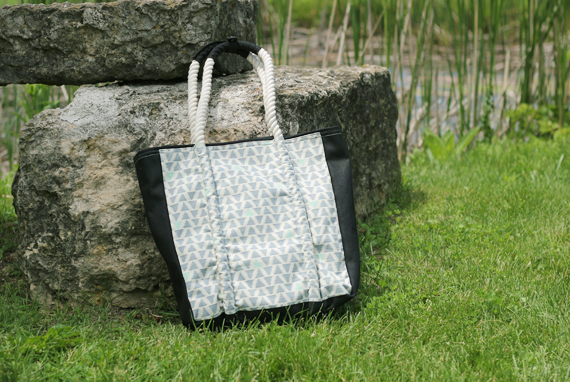 Last month, I did a style post where I featured an amazing tote bag (the 'Mint & Grey Rope Tote') that I'd just received from the fine folks over at sustainable design company Hearts. I gushed about how it is equal parts cute and handy, about how it was ethically sourced and produced, and about my adoration of that incredible hand loomed ikat fabric. Well today, I'm thrilled to announce that I'm partnering with Hearts once again, this time to give away one of these gorgeous bags to one of YOU! 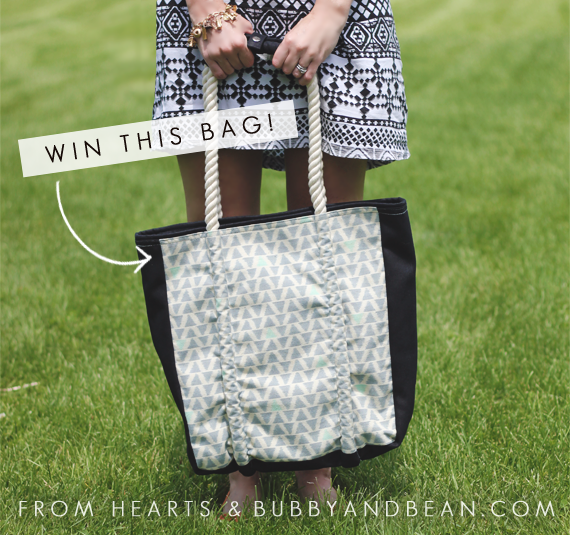 To enter, just visit the Hearts website and leave a comment below telling me which item is your favorite. That's it! This giveaway will run through July 18th and is open to all Bubby and Bean readers. The winner's name will be randomly chosen and announced shortly after. Thanks again to Hearts for being such a wonderful company and for giving Bubby and Bean readers the chance to win such a rad bag! Oh, and if you want to pick up a little somethin' from Hearts in the meantime, they have graciously extended a 30% off coupon to guys! Just use the code BUBBY30 to redeem. I like the Sterling Silver Anchor Charm necklace! I like the mini chevron earrings! It was hard to narrow it down, though. Love the sun kissed sisal tote as Yellow is my favorite for all things summer! I've been collecting small necklaces lately and the Strawberry Fields Necklace is so adorable! Thanks for the opportunity to win the tote! holy tote! and what a great spot, that hearts.com! so glad to 'meet' them today! i loved the Mystic Treasure Vintage Brass Adjustable Ring!! Loving the electric crochet clutch & coffee sack carry all tote! I like the Coffee Sack Carryall! Thanks for the chance, and Happy Friday to you! Now following hearts on twitter (@shopjustByou). Following hearts on Pinterest (@justByou). Following hearts on G+ now (Kim Cee). I am totally in love with the brass chevron earrings. i really like the tan chevron rope tote! i adore the mint and gray triangle rope tote!!! soooo cuuuute. i'm torn between the rope tote and the foldover crossbody in the same print! Love the Mint and Gray Triangle Foldover Crossbody bag! My favorite item is the Mint Chevron Foldover Crossbody Bag! Oh I love the mint chevron rope tote bag, but am also loving all the stud earrings they have, especially the in transit turquoise & silver studs. Love the Speak Carry All Sari Tote!! This is an amazing company! The colorblock recycled bead necklace! What a cool company!! Posted the photo on Instagram! Pinned the top image to Pinterest!! I follow Hearts on Twitter. My favorite is the denim pom pom clutch! I follow Hearts on pinterest! I'm following Hearts on twitter! The Pretty in Pink Vintage sunglasses! I like the secret garden floral 3-in-1 headwrap! My favorite item is the copper triangle stud earrings and this bag! Crossing fingers! I love the armor bullet casing layered necklace! I ADORE the graphic ikat foldover crossbody bag. I love the Sterling Silver Mandala Sari Wrap Bracelet in Red!